You may not think of your clothes as pollutants, but tiny plastic fibers from synthetic textiles (microfibers) are big contributors to water pollution. Clothes and fabrics made with synthetic fibers are using plastic fibers (e.g. polyester, nylon, acrylic, fleece and athletic clothing). When they are washed, they break apart in the washing machine, and so get into the wastewater system, and eventually into our rivers and oceans. These microplastic particles are smaller than 5 mm. One 2011 study found that "Experiments sampling wastewater from domestic washing machines demonstrated that a single garment can produce greater than 1900 fibers per wash" (which then goes directly into wastewater). And while a 2017 study didn't examine sources of microfibers (air, rain, water treatment plants, etc) found in numerous Hudson River water samples, the researchers estimate that the entire Hudson River dumps 300 million human-made fibers into the Atlantic Ocean each day. Wow. The big questions: Can anything be done to stop this water pollution? And what is it doing to us and wildlife? Today I am posting links to these stories because it is of concern to all of us and to future generations, and we need to think about and address this issue. The faded, “distressed look” of a favorite pair of blue jeans, may come with a hidden price for the residents of New York. The Hudson River dumps 300 million clothing fibers into the Atlantic Ocean each day, according to a recent study in the Marine Pollution Bulletin. Many of the fibers come from aging clothes, rinsed out with the laundry and into the environment. Approximately half of the fibers were plastic, while the remainder were spun from natural materials like cotton or wool. Invisible to the naked eye, these fibers can cause health problems for animals and humans. Pollutants and other fine particles can hang in the air and travel great distances, said George Thurston, who studies the health effects of air pollution at New York School of Medicine. These airborne fibers can also be toxic. During the industrial revolution, byssinosis or brown lung disease, befell textile plant workers due to cotton or other fibers in the factory’s air. But Thurston said more research is needed to ascertain how microfibers get around. So-called microplastics are tiny — less than 5 millimeters across. They can come from litter or plastic bags that break down over time. ...."These small little threads, they find their way into the wastewater treatment system and then, into our aquatic environment." Austin Baldwin, a hydrologist with the U.S. Geological Survey, studied the St. Croix, Namekagon and Mississippi rivers in 2015. The results were published earlier this year in a brief issued by the National Park Service. Baldwin's team found microplastics in all of the samples they took of water, sediment, fish and mussels. The level of concentration was surprising: They found as many as 111 microscopic pieces of plastic in a single fish. Scientists worry that microplastics might clog the digestive systems of fish and make them feel full, so they end up starving. Baldwin said there need to be more study of the biological impacts. 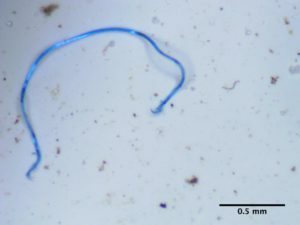 Microplastic fibers in the wastewater are so small they slip through filters and screens designed to capture larger particles. Hoellin's team sampled Chicago rivers and found higher concentrations of microplastics downstream of sewer plants. "What I've seen is that some wastewater treatment plants are really effective at retaining 99 percent of the microplastic that comes in as raw sewage," Hoellin said. "But even that 1 percent, when it's added up on a daily, yearly basis, is amounting to a lot of plastic pollution." Hoellin noted there's no legal requirement for wastewater plants to treat for microplastics. " By the time the treated wastewater is discharged into the Mississippi River, Rogacki [Larry Rogacki, assistant general manager of the Metropolitan Wastewater Treatment Plant in St. Paul, MN] estimates that 96-98 percent of all microplastics have been removed. Retrofitting the plant to eliminate 100 percent of microplastics would require installing sand filters that could capture smaller particles, he said. It would be costly — close to $1 billion. ....What scientists say might be more effective — and less expensive — is to figure out how to keep plastic out of the wastewater stream in the first place.